Introduction…Anyone ever had an experience where, despite pain, suffering, injustice and oppression, you still prospered? Talk about it. Why would God do or allow such blessing in the midst of injustice? After listing the names of the sons of Israel and telling how many of them that made the sojurn to Egypt, the book of Israel’s Exodus (or way out…of Egypt) opens with these words… “Now Joseph and all his brothers and all that generation died, but the Israelites were fruitful and multiplied greatly and became exceedingly numerous, so that the land was filled with them.” Ex. 1:6-7. Four hundred years after both Jacob and Joseph pass away, Moses, the author of both Genesis and Exodus, tells us that a new pharaoh sits on the throne, one who did not know about Joseph or his salvific exploits on behalf of Egypt and Egypt’s throne, and thus begins our drama. We move from the lives of Israel’s early partriarchs, Abraham, Isaac, Jacob and Joseph to the lives of a nation—a nation led by one man, Moses. We move from Genesis, where we learn how Israel came to be in Egypt, to Exodus, where Israel will miraculously leave Egypt to take possession of her previously promised lands back in Canaan. The sins of the Amorites have reached the full measure. It is time for a change. 5) who then comes up with a harsh plan to suppress, contain and enslave their vast growing numbers, vv. 12-14. I wonder will it work. Joseph was already in Egypt. came to power in Egypt. “the Israelites have become much too numerous for us. 11So they put slave masters over them to oppress them with forced labor and they built Pithom and Rameses as store cities for Pharaoh. 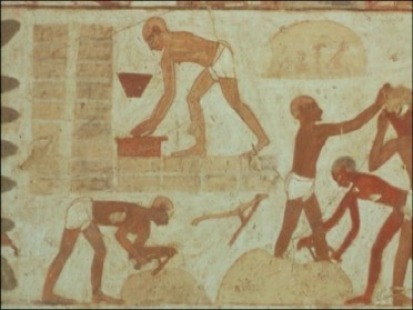 in all their hard labor the Egyptians used them ruthlessly. Are Jacob and Israel the same person? Why are both names used here? Did God not change Jacob’s name? Did he still use both names? Did this include wives and children or just children? So 12 sons had 70 children? Did this include Joseph’s sons because Joseph is mentioned after the mention of the seventy descendents? How long did it take them to die? Did they live long like their ancestors did? Didn’t they live to be like over a hundred? How old was Joseph when he died? His brothers? Did everything go well with them until his death? How about their children? Did they all get along? All the cousins? Then second and third and fourth cousins? Sounds like they flourished to me. Is this why God took them to Egypt in the first place, to give them a place to prosper? To prosper off of Egypt’s great wealth? And to give the Amorites—the peoples living in the Promised Land—to build up more sins and therefore more judgment, because God was not unjust in taking their land away? (See Gen 15:12-15). How many? Some say, several million. Where do they come up with that figure? So because they were multiplying so rapidly, does this mean economic times were very good for them? Were they wealthy or just prosperous—ate well, flocks multiplied? I could see where after four centuries, everyone would forget about the past? That is twice as long as the history of our country, or it would be like going back to the Pilgrims? And we have certainly after almost 400 years thrown away most of their values. It’s illegal to talk about God in school. Pray to him. Post the Ten Commandments. Adultery is acceptable. We are working on homosexuality. So I could see where in 400 years, people might have forgotten where these people had come from in the first place. After all there were only about 80 in all to begin with. Nothing in Egypt. This all leads to another question: how did they maintain their ethninticity all this time, that is their nationality? Did they all intermarry cousins, etc.? Did they ever marry Egyptians? Were they becoming more than the Egyptians? So he seems to be using intimidation? Will this work out? Is this the best strategy? Is this smart? Who were their enemies? Usually it was kingdoms from the other side of the Fertile Crescent. In later centuries it will be the Assyrians, the Babylonians and the Persians. After that the Romans? Who cares if they leave? How would they leave? There are so many? How long a period of time was all this? Ten years? Twenty years? Fifty years? How did they work them ruthlessly? Did they not let them tend their flocks? Did they work long hours? No time with their families? the Egyptians used them ruthlessly. Whos? the sons of Israel, who, Jacob, his family, 2 Reuben, Simeon, Levi and Judah; Issachar, Zebulun and Benjamin; Dan and Naphtali; Gad and Asher, descendants of Jacob, seventy in all, Joseph, all his brothers, all that generation, Israelites, them, new king, who, his people, Israelites, we, us, they, them, our enemies, slave masters, Egyptians. • Jacobs’s sons all die off. vv. 1-6. • But as their descendants replace them, and they become numerous. v. 7. Summary… A new pharaoh, having no knowledge of Joseph and what he did to save Egypt and prosper the royal dynasty, is threatened by the growing numbers of the descendants of Joseph’s father, Israel, and so in an attempt to keep them subdued, via forced labor, he enslaves the children of Israel. Bottom line…a new day, a new king, and a new set of circumstances result in the sons of Israel being oppressed as opposed to protected as their forefathers were. Whys? What do I learn about God? Life? People? Myself? • Most big things started out small, such as a savings or retirement account, a business, a country, an illness, such as cancer or even addiction. Everything has a beginning somewhere. The children of Israel started out with one couple, Abraham and Sarah. From there was added one son, Isaac. Then Isaac had two sons, only one of which, Jacob, did God extend the same promises of a people, land and blessing to that he had extended to Jacob’s father and grandfather. Then, via 12 sons, Jacob’s family, four hundred years later, as grown into a subdued people group suffering under the harsh hand of Egyptian rule. The church also started out small. One shoot from the stump of Jesse, Jesus, calls out 12 to follow, trust him and build his church. Surrounding those 12 is another hundred plus. At Pentecost, God’s Spirit liberally pours himself onto thousands who repent of not having trusted the Savior’s sacrifical atonement for their imperfection, and from there, over the next almost two thousand years, millions and billions come to trust, follow and obey the name of Jesus. Most big things started out small. • Despite, persecution, repression and injustice, God’s blessing prospered. Persecution will not stop the will of God. God’s will always trumps man’s misguided plans to thwart his plans and will. Nothing was going to stop the Children of Israel from growing into a people group, not even harsh, repressive slavery. God wins this one. He always does. • God allowed the king of Egypt to make his natural choices. Pharaoh saw numbers and naturally saw threat. In his own way, he attempted a solution. Little did he know his flawed, insecure solution would be used by God to bring about the very thing he feared. His lack of knowledge or trust in Yahweh or I AM God resulted in his and his nation’s own downfall. One pharaoh trusted many years before and is richly blessed; another does not, and is cursed by the God he refuses to bow down to. He chose the wrong god and wrong methodology. This is the story of man. Again and again, foolishly kings, man, rulers attempt to disprove the Creator of the Universe, and again and again, they are brought to their broken knees. Litle does man realize that all will bow; those who do so because by faith and trust, they see or believe in an invisible Creator find the salvation they so desperately were seeking; those that refuse choose their own required destruction. To submit or not to submit, that is the question. It makes all the differene in the world. In fact, you could say, it’s the only difference that really counts when ALL is said and done. • Despite God having chosen and blessed the children of Israel, in the shorter term, just as he had with Jacob and Joseph, he allowed his beloved to suffer at the hands of an unfair earthly judge and ruler. We tend to think that if we suffer, something is wrong, and perhaps it is, but not in the way we think. Things have been wrong since the beginning of Creation, or at least the man and the woman’s choice to not trust God and instead believe the half-truth of the Deceiver. So definitely things are wrong. Yes, there is sin, injustice, crime, poverty, suffering and misery but, due to sin and man’s flawed choices. And as a part of this, God’s people, from time to time and in different seasons, will suffer in the midst of man’s chaotic unrighteousness. And sometimes, God’s people will even suffer because they are God’s people. The Scriptures have foretold us this, and we know even from the onset, as the righteous Job learned, there is a spiritual war that is being waged within the eternal heavens and that has spilled over into time and space, including earth itself. And yes, God does allow his people…those that do believe in him…to suffer injustice in the midst of this. Sometimes, we even suffer, due to our own sins and the sins of the righteous. No one is perfect. And yet, God will use the cries of the suffering to demonstrate the contrast between good and evil, salvation and destruction. So yes, for a time, God’s people are allowed to suffer in the midst of evil, but justice delayed will never be justice denied. And we have a Savior. • Threat is natural element of a fallen, imperfect world, and thus Pharaoh felt threatened by what he perceived he might not be able to control. His security was not in God, but in what he could do. Well, what he does turns into a royal failure. Note: While I may not include 2002’s application every time, perhaps for the sake of truth in time or a longer-distance Spiritual perspective, from time to time, I may mix it in with 2014’s application. Struggles (2002): I have been really dragging lately–got my nights mixed up with my days and would rather work and study through the night and sleep in the mornings. Things are pretty quiet around the house (without Jordan home and gone off to college) and the church (since, we have finally completed constructing our new church home). I find myself struggling to prepare or study ahead. Not sure if its burnout or PBS… post-building syndrome or what? There is still a lot to do—much of which I can’t do or don’t want to do by myself. So I am kind of in the middle—unfinished. It is something I am very uncomfortable with, but am trying to accept on a daily basis. 2014 Update…We had begun planning to build with the purchase of 26 acres back in the early to mid-90s. After several church fractures in sucession where one church became three, we were forced to put our building plans on hold for quite a few years. Finally in 2000, after some healing and Spiritual rebuilding, we raised up a mortgage buffer fund of $50,000. In 2001, we began building a church of our own. We moved in during the summer of 2002. So in some ways, 2002 represented the completion of an almost decade long dream. Thanksgiving (2014)…We are still alive, and at times, in ways perhaps not measured by man, we are thriving. Over the years, what many within the church growth world thought was God’s blessing at the time, now, many years later, appear more like cheap man-made imitations. Numbes, expansion, buildings, monies given, even evangelism and outreach can all appear like signs of God’s growth, and they may well indeed be at times, but NOT always. True growth begins from the inside out…a mind reborn, a love sustained, a flesh slain, a flawed human instinct crucified, Spirit-driven counter-intuitive obedience and discomfort, truth courageously spoken and confessed, Spiritual stones becoming a Spiritual one, working through conflict and differences to accomplish a Spirit-inspired greater good. What a broken, dysfunctional and flawed family of believers failed to accomplish in the way of outward, artificial and superficial numbers it has more than made up in attempting to create a real, bibical and Spiritual enviromentf for growth, one characterized by more than your average or typical Spiritual depth, truth and honesty. This week. It has been a good-time, another good month. June was focus, and a lot had to get done and was done. July was about balancing ministry with some time off with my family. We did pretty good. I think we experienced a happy medium, and now the pedal has once again begun to be pressed ever more aggressively. Thank you, God. Now please, bless all my Spiritual endeavors, including writing and ministry. Principles: 1) Big things start out small and can grow very large. Sometimes, the growth can even be exponential as it was in the case of Israel and later the church, which means in the beginning, there is slow growth over a long period of time, but then suddenly there comes an explosion of growth over a very short period of time. We typically refer to this as overcoming the learning curve, and in many ways, with respect to humanity, it would seem that in the last few centuries, and especially with respect to technology, we have become the beneficiaries of previous generations’ long, slow climb up the learning curve’s more horizontal section. Thus, we are now screaming up the vertical section of the learning curve with explosions of knowledge. Perhaps, we only think we are on the vertical section? Perhaps we are still in the midst of a long slow climb? But with the ability to destroy ourselves many times over via nuclear annihiliation, it would seem we are peaking with respect to knowledge and technology. And in fact, what does come next on the learning curve because afterall, you can’t grow at this rate forever? Eventually comes a recession or bust, with the learning curve morphing downward again and thus becoming a bell curve. 2) Only God can defeat bell curve. What does that look like? Heaven, I suppose. Unlimited growth. Unlimited blessing? I am not sure how it all works. I do know that despite suppression and ruthless oppression, both God’s old covenant people and later on God’s new covenant people experienced exponential growth and blessing. Therefore, don’t discount both God’s provision and blessing even in times of great sinful hardship. God can and will bless and reward his people for their faith-based obedience, hope, love, trust and service. and find satisfaction in all his toil –this is the gift of God. nothing can be added to it and nothing taken from it. God does it so that men will revere him. When I read Solomon’s thoughts on time, I realize that I have only begun to skim the surface concerning the manifold seasons of life. I would venture to say that just about nothing about life or ministry has ever been predictable. It’s never been the same. I would even venture to say that while yes, the earth’s hemispheres move from cold to hot back to cold, even within the designated seasons, while there is some similiarities, even these similarities seem to vary from year to year. Some summers are cooler than normal; others hotter and dryer; some wetter. So what is Solomon actually saying? What is he trying to tell us and why? That life is not static; it’s always in a constant state of flux or change. That you can’t hitch life’s wagon to any one thing, time or season because things will change. A baby will be born, someone dies; someone is healed, another dies; there are moments of both joy and tears. But in the midst of life’s seemingly constantly unpredictable chaos, one thing stands for certain…God exists. God is in charge; God is in control, so Solomon concludes, we all might as well take a chill pill and, within divinely-guided moral boundaries, enjoy this life because it’s all going to happen, whether we want it to or not, anyway. What about your students? What are some of their current struggles? Which principles seem to relate? Scripture quotations, unless noted otherwise, are taken from the Holy Bible: New International Versio‚ NIV‚ Copyright 1973, 1978, 1984, International Bible Society. Used by permission of Zondervan Bible Publishers. All rights reserved. This entry was posted in Learning Center Lessons and tagged Exodus, Israel, Life of Moses on August 2, 2014 by admin.